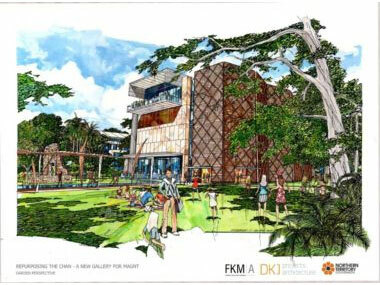 A concept drawing for the exterior of the new Chan Building art museum in central Darwin. One of the most exciting architectural projects in the Northern Territory will be led by local firm DKJ projects.architects in partnership with the nationally acclaimed Fender Katsalidis Mirams Architects. The re-purposing of Darwin’s Chan Building into a modern, dedicated visual art gallery was announced in the 2015 NT Budget earlier this year. And the $18.3 million project using a mix of private and public funds will transform the Chan with stunning proposed designs for the building. It is not yet known whether all the art in MAGNT – including its significant collection of early Papunya boards and the annual Aboriginal & Torres Strait Islander Art Awards (the Telstras) – will move into the Chan, leaving only museum matters in the current building. The Sydney-based Fender Katsalidis Mirams Architects’ design expertise extends to a broad range of sectors including urban design/master planning, residential, institutional and commercial. They are one of Australian’s leading design firms and bring cutting edge design skills and broad experience of Gallery and Cultural projects. These include the prize-winning private Aboriginal art museum, the Garangula Gallery at Harden – between Young and Cootamundra, Bendigo Art Gallery, a new waterside art centre for Hobart, the Ian Potter Museum at Melbourne Uni and a strange new viewing platform for Circular Quay. DKJ projects.architecture is a Darwin based multi award winning design firm with experience in cultural projects such as the Charles Darwin University Centre for Indigenous Knowledge, Nhulunbuy Airport and a mix of hotels and apartment blocks. The practice brings to the project expert technical and documentation skills based on 40 years of design for the Northern Territory environment and construction industry. 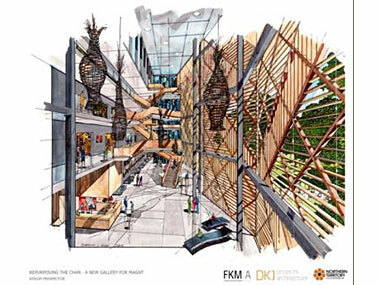 Interior concept drawing of the vastly expanded Chan Building where the Museum & Art Gallery of the NT will move.